Applied Inspection offer a comprehensive range of non destructive testing, engineering inspection, consultancy and training. Our laboratories are headed by experienced and knowledgeable personnel with the commitment to provide our customers with a Non Destructive Testing service second to none. Our level III personnel carry out contracts for a wide range of small and large companies working to PCN, ASNT, ACCP and other accreditation schemes. Our client base spans the globe. Our Hardness Surveys give an excellent indication of the tensile strength of a material. Applied Inspection is recognised throughout the UK and Europe as being at the forefront of testing on rail axles in accordance with Railway Group Standards. Our dedicated rail division offers a comprehensive range of services carried out by highly qualified and experienced personnel who are all PTS and Safety Critical approved. Applied Inspection work with a number of companies providing an Outsourced NDT department, allowing them to concentrate on their core business activities - enabling them to remain profitable and competitive. Applied Inspection Ltd offer Visual Inspections. Visual Testing can identify where a failure is most likely to occur and as well as identifying when failure has commenced. Applied Inspection Ltd offers Eddy Current Testing - This technique is used to detect surface and near surface defects on relatively small areas; without the need to remove surface paint prior to testing. We offer Dye Penetrant Testing on site or in one of our laboratories. With our capacity, capabilities and our collection and delivery service, we can assure you of a quality service with a fast turn around to assist you in achieving your production commitments. Applied Inspection offers a cost effective MPI service to a wide range of industries at highly competitive rates. We are able to undertake MPI up to 3000 amps in our laboratories or on site - 24 hours a day, seven days a week. Our technicians are dedicated and experienced personnel, with many certified to PCN, ASNT and ACCP Level III. Many of our senior technicians are known throughout the industry and are recognised as being highly trained, competent individuals who have worked for Applied Inspection for many years. Offering a wide range of training courses in Metallurgy/Materials, Welding and Non-Destructive Testing. Offering a wide range of metallurgical analysis and materials consultancy; including component failure investigations, warranty claims, metallography, reverse engineering and corrosion investigations. Our laboratories are headed by experienced and knowledgable personnel with the commitment to provide our customers with a radiographic service second to none. 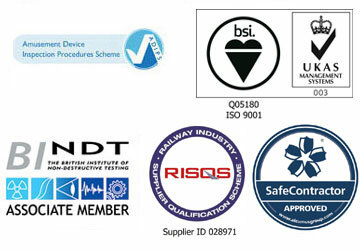 Applied Inspection Ltd is an ISO 9001:2015 and RISQS accredited NDT services company providing Non Destructive Testing, Welding, Welder Training and Materials Testing both on site and from one of three fully equipped laboratories in the UK. Applied Inspection has a world wide reputation for providing highly professional NDT services to a vast range of industries – petro-chemical, nuclear electric, off-shore, rail, power generation, mining, gas, construction, foundries and general engineering. Our 24 hour – seven days a week NDT service ensures that we’re always available to our customers. Our major strength is a superb team of highly qualified and experienced personnel, the majority of whom have been with us for many years; we are now widely renowned for being one of the most qualified NDT services companies in the UK.